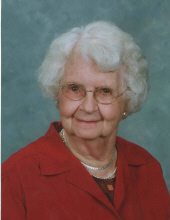 Helen Marie (nee Fritz), age 101, passed away Sunday, April 14, 2019, beloved wife of the late Odes Bastin, loving mother of Marvin (Kiki) Bolender, Dexter (Kathleen) Bastin, Charles (Sherry) Bastin and Wayne (Betina) Bastin, devoted sister of Laurajean McGovern, Carl Fritz and Ralph Fritz, also survived by numerous nieces, nephews and grandchildren. Services will be held at the Williamsburg Methodist Church, 330 Gay Street, Williamsburg, Ohio on Saturday, April 20, 2019 at 1:30pm. Visitation will be held from 12:30pm until the time of service at the church. The family Prefers memorials to the Williamsburg United Methodist church at the address listed above. To send flowers or a remembrance gift to the family of Helen Marie Bastin, please visit our Tribute Store. Deliver flowers to the church. "Email Address" would like to share the life celebration of Helen Marie Bastin. Click on the "link" to go to share a favorite memory or leave a condolence message for the family.